Beiqi Foton Motor Company Ltd (rolls off the tongue, doesn't it? ), established in 1996, is one of China’s leading manufacturers of heavy-duty commercial vehicles. 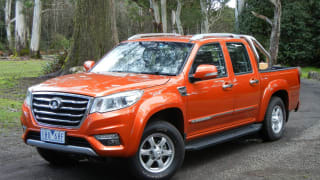 It also produces a light commercial range including the Tunland ute, which has ridden a rocky road in Australia with minimal sales traction since its local launch in 2012. Back then distribution was handled by Queensland-based FAA Automotive Australia. In 2014, Ateco Automotive took over, but that only lasted until mid-2017, when Foton itself took charge of all Australian distribution and sales under the Foton Motor Australia Ltd banner. A key factor in this move was a rationalisation of the local Tunland fleet, which now consists of only a dual cab ute. But through Foton’s numerous joint ventures with premium OEM suppliers (including Cummins, Borg Warner, Dana, Bosch and ZF), the latest Euro 5-compliant Tunland combines known brand components in a low-priced ute with which Foton plans to finally build a solid following. The Foton Tunland is made in two model grades – the H-series (High End) and S-series (Super Value). The S-series (which is not sold here) is a low-cost, steel-wheeled version with components sourced from Chinese suppliers. The H-series is the premium model sold in Australia, so don’t let the red S badge on the tailgate confuse you as it did us at first. The S badge stands for Sport (not Super Value) and is only affixed to H-series vehicles. The Tunland range comprises 4x2 manual ($26,990), 4x4 manual ($29,990), 4x4 auto ($33,990) and, thanks to its leather seats, 4x4 auto Luxury ($35,490). The 4x4 manual Luxury has recently had a big price reduction from $30,990 to $27,990, reflecting Australia’s growing preference for automatic transmissions. Our test vehicle is the 4x4 auto, which for a snip under $34,000, brings numerous useful and desirable features including 17-inch alloys and beefy 265/65R17 road-biased tyres with matching spare, power/heated door mirrors, daytime running lights, side steps, auto headlights, rear-view camera and rear parking sensors, leather-trimmed steering wheel with audio/cruise control buttons, power windows, four-speaker sound system with multiple connectivity, eight-way (manual) adjustable driver’s seat and more. Plus there’s an extensive range of accessories. This is a big ute with an imposing presence, much like the Ford Ranger with which it shares similar dimensions (if not looks). Compared to the Ranger Wildtrak, the Tunland is 115mm shorter in wheelbase and 45mm shorter in overall length, but 20mm wider and 22mm taller. Ground clearance of 210mm is 27mm less and its kerb weight undercuts the Wildtrak by 250kg. The Tunland uses traditional body-on-frame construction with a steel ladder-frame chassis, coil-spring twin-wishbone front suspension, leaf-spring live rear axle, four-wheel ventilated disc brakes and hydraulic power-assisted rack and pinion steering. Chrome body highlights include the grille, driving lights, side mirrors, door handle inserts and body badges. The dashboard and interior trim feature strongly textured grey surfaces with a tasteful mix of piano black, chrome, satin chrome and carbon fibre-look highlights. There’s good comfort for driver and front passenger, with a height-adjustable steering wheel and multi-adjustable driver’s seat with adequate under-thigh support that doesn’t feel too short like a Triton. The driving position is a big improvement on other Chinese utes we’ve tested, and is on par with many of the major players. The rear bench seat’s low cushion height results in raised upper thigh angles and knees, but also aids in providing unusually generous headroom, even for tall adults sitting in the higher centre position. One of the Tunland’s strong points is its Euro 5-compliant 2.8-litre four-cylinder Cummins ISF turbo-diesel, which Foton claims is the first ute in the world to be powered by this engine. It delivers 130kW at 3600rpm and 365Nm across a pretty flexible 1600-3200rpm torque band. The smooth-shifting six-speed German automatic behind it is from another premium OEM supplier in Friedrichshafen AG, better known as ZF. Its gearing and shift protocols are well matched to the engine’s characteristics, offering a choice of full-auto mode or sequential manual shifting. Console buttons also provide a choice of Economy, Sport or Snow driving modes. American OEM giant Borg Warner supplies the part-time, dual-range 4x4 transfer case, while another major US supplier - Dana - has its stamp on the front drive-shafts and live rear axle assembly, featuring a 3.9:1 final drive and limited-slip differential. There’s no locking rear diff option available. Foton’s official combined figure is 8.7L/100km but our ‘real world’ road test figures based on fuel bowser and trip meter readings came in at 12.2 (after 503km) and 12.1 (after 297km). Based on those figures, you could expect a driving range of around 620km from its 76-litre tank. However, after only 500km the fuel gauge needle was nudging the red zone and the low-fuel warning light came on, so we weren’t game to find out if there was another 100km-plus of driving available from the theoretical fuel remaining. 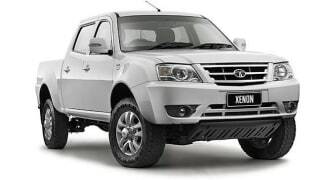 Figures used here are provided by Foton Motor Australia Ltd and differ slightly from those shown in sales brochures. With a claimed kerb weight of 2000kg and 2925kg GVM, the Tunland is rated to carry a decent payload of up to 925kg. It’s also rated to tow up to 3000kg of braked trailer, and with its 5925kg GCM, can tow that weight without having to reduce its peak payload, which gets a big tick from us. Load tub dimensions of 1520mm length, 1580mm width and 440mm height provide more than a cubic metre of enclosed load volume. There’s also 1140mm between the wheel arches (not wide enough for a standard Aussie pallet) plus four sturdy tie-down points for securing loads. Cabin storage options includes a bottle holder and pocket in each front door, a shallow tray inset in the centre dash pad, an overhead sunglasses holder and single glovebox. The centre console has an open cubby up front, two cup holders in the centre and a small lidded box at the back which doubles as a well-placed armrest. Rear doors also have bottle holders and storage pockets, plus there are flexible storage pockets on the rear of each front seat and a fold out dual cup holder on the rear of the centre console. The rear bench seat’s base cushion also swings up through 90 degrees to reveal two hidden storage areas beneath for the wheel-changing tools and other smallish items. It’s a tight build free of rattles and squeaks, but the ride is too firm when empty or lightly loaded, particularly in the leaf-spring rear suspension which feels every small bump and delivers a sharp kick in your back over larger ones. Otherwise, the chassis performance is more than adequate with its four-wheel disc brakes and steering that’s responsive and nicely weighted. Engine refinement and noise insulation are not best in class, but at highway speeds the combined engine, tyre and wind noise is certainly low enough to allow conversations without raised voices. The Cummins fairly lopes along here, with only 1800rpm at 100km/h and 2000rpm at 110km/h. It’s also quite an agile and energetic performer around town, particularly in Sport mode. Maximum torque of 385Nm from the Cummins diesel is far from the strongest in this category, but the Tunland’s relatively low kerb weight helps to compensate for it with brisk getaways from standing starts and good throttle response in city and suburban driving. To test its GVM rating we strapped 770kg into the load tub, which with driver was only about 50kg short of its 925kg payload limit. The rear springs compressed 50mm while the nose rose 18mm. This resulted in a near-level ride height and noticeably improved ride quality, with no major decline in steering or braking response. With this load it was a competent performer on a variety of sealed and unsealed surfaces, including some bush tracks on which we engaged in both high and low range 4x4. Back on the bitumen, it also coped well with our two kilometre, 13 per cent gradient set climb, maintaining the 60km/h speed limit in third gear at 2250rpm all the way to the top. Engine braking on the way down, though, was compromised by the auto transmission’s unusual shift protocols. With second gear manually selected (in sequential shift mode) it over-rode that selection and shifted up to third when the engine reached 3250rpm on over-run. We tried it again several times and got the same result. Not sure if it’s an engine protection measure on Foton’s part (redline is 4000rpm) but it’s not a nice surprise when you’re heavily loaded on a steep descent and relying on engine braking to help restrain your speed. Our only other gripes were poor radio reception on the AM band (too bad if you like talkback) and the cruise control, which stopped working during our test and would not switch back on. Its three-star (out of five) ANCAP safety rating is poor, with single airbags for driver and front passenger only. Bosch electronic stability control includes brake-force distribution and hill-start assist, but there's no trailer sway control or AEB. The rear seat offers three head restraints and lap-sash belts. There are also ISOFIX attachments on the two outer seating positions, but no top tethers. Foton says it has identified differences in ISOFIX fittings between China and Australia, which it is now addressing for future export models. Expect a three year/100,000km warranty and service intervals of six months/10,000km whichever occurs first. Roadside assistance is also available. The 2018 Tunland is a big improvement on any Chinese ute we’ve driven. Foton has done a commendable job in selecting known brand components and bringing them together into one cohesive package that delivers robust performance. Although it doesn’t quite equal the sum of its parts (mostly owing to poor safety features and some technical quirks), it’s still a lot of 4x4 dual cab ute for not a lot of money, and it's worthy of a test drive. Does the Foton Tunland challenge negative perceptions of Chinese utes? Tell us what you think in the comments below. Great Wall has been China&rsquo;s best-selling ute brand for nearly two decades, so it&rsquo;s no surprise it's having a crack at our hotly contested market, but will its low prices be enough to make it a winner?